SHENZHEN, CHINA, April 21, 2018 /24-7PressRelease/ -- In recent years, the transparent LED display enjoys a high popularity among the display industry. As a rising star of the LED market, Whether it is in the trade show or in many recent outstanding cases, the transparent screen frequently appears on related exhibitions and fantastic cases. In addition to the extremely high market value, transparency, lightness, fashion, aesthetics and other characteristics of the transparent screen help it gain an appreciation of many exclusive clients. The transparent screen increasingly appears in high-end places like highrise building, museums, science and technology exhibition hall, shopping mall, automotive 4S shop, experience center, boutique, etc. Businesses are now more aware of the importance of the customer-friendly environment, and the shopping experience. They are optimistic about the commercial value of LED transparent screen might bring them. 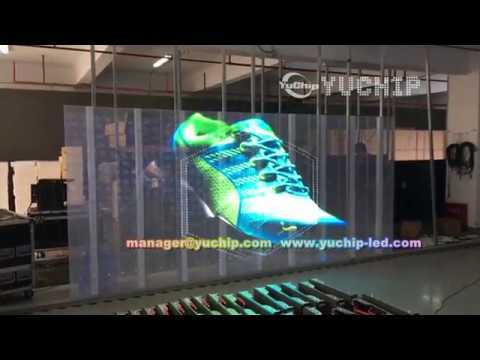 In order to effectively strengthen the customer's impression of the brand, enhance the shopping experience, and increase sales, many retailers tend to show product pictures and promotional videos with transparent LED display. Led transparent screen is an improved and innovative product based on the traditional LED strip screen. In the patch manufacturing process, lamp beads packaging, control systems, etc. have made targeted improvements. Coupled with the hollow design structure, the product's permeability is greatly improved.Compared to other transparent display technologies like the OLED, the transparent LED screen also superiorities in seamlessly spliced, non-dimensional limitations, etc. Technically speaking, various led transparent screens have a high degree of maturity and stability, and successful application in subdivided areas, but the contradiction between dots spacing and the transparency does exist. The smaller the spots spacing, the higher the definition, and the lower the transparency. While the excellent transparency of transparent screen is the reason why it's booming in the market. Therefore, many LED display manufacturers keep improving transparent display products by increasing the transparency. In order to provide products that are highly suitable for the market demand, manufacturers should skillfully reconcile the contradiction between definition and transparency. Modern transparent LED display has all kinds of types, the structure is complex, the size isn't the same, the standard cabinet couldn't meet the needs of all projects, CONCRE can be customized the best product solution according to the reality situation, to ensure the permeability of transparent LED display, completeness of display and consistency.